Well I’ve decided that others may think I play favorites, and probably to an extent I do with the owners I know well. I genuinely adore Anna, from True Thai, so expect to see post about her occasionally. I have developed friendships with many of the restaurant owners I know in town, beyond just going to their place of business, and I truly believe that food is an excellent way to build a friendship. I can bond with anyone over love of food. We were at True Thai the other night to celebrate getting rid of a lease vehicle that I swear was cursed. It was pretty quiet while we were there, so Anna offered to make some custom orders for us and asked us to try some things she’s thinking about putting on the menu. 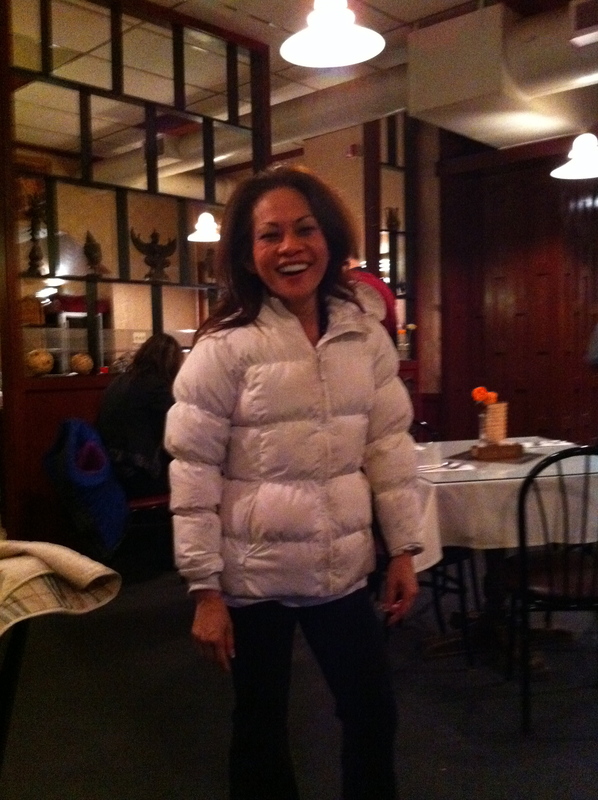 We also discovered that she and my seven-year old daughter wear the same size jacket, and that Bella is a size bigger in winter boots than Anna. Additionally, I think I may have neglected in my earlier post about True Thai to mention the Thai style cashews, that was a grievous error for which I hope my readers will forgive. 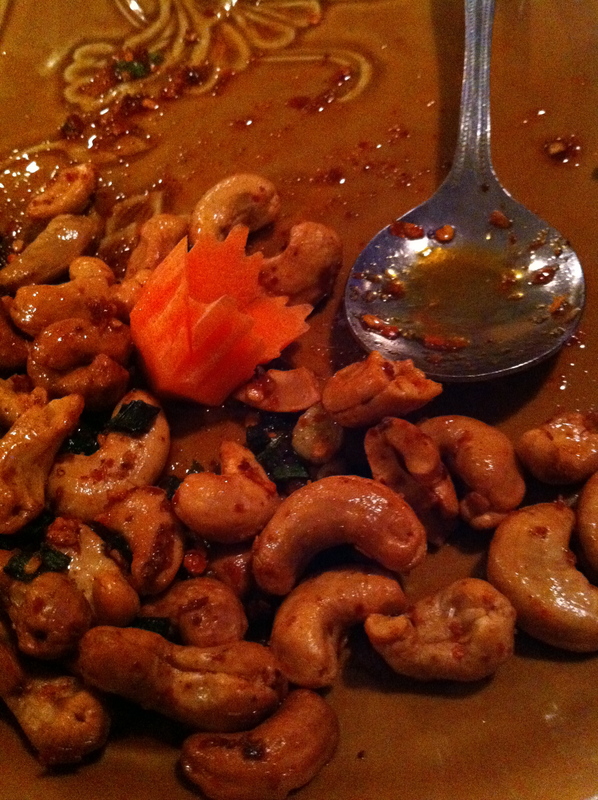 If you go there, order the cashew appetizer, but not how it is on the menu, ask for Thai style. You won’t be sorry. As a general rule, I try to never write a review of a restaurant based on one visit. I feel that usually that isn’t an entirely fair assessment, considering sometimes a place is having an off day, or especially when a place first opens, it tends to be all about quality control which can slip after a while. These and other reasons are why I try to go to a place a few times before forming a solid opinion. Well, I’m breaking my own rule. 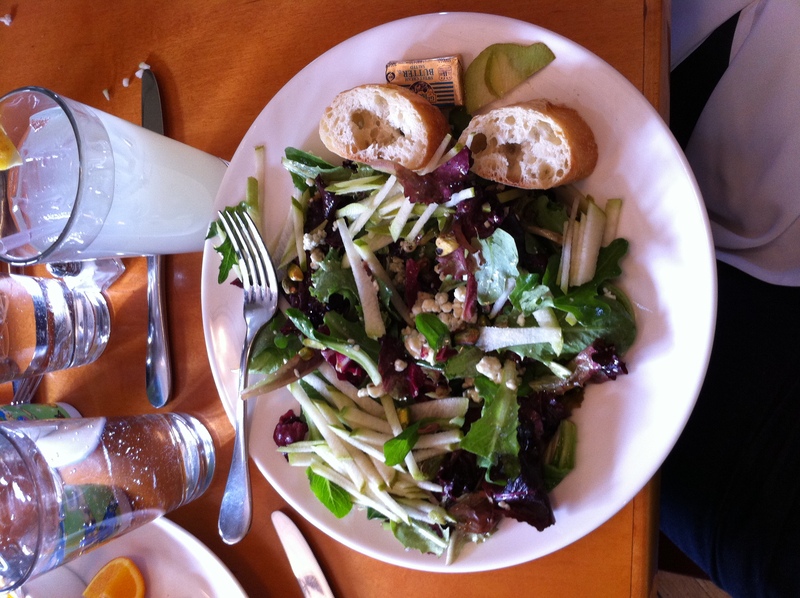 I was at Cafe Twenty Eight yesterday for lunch and it was great! I ordered the pear salad, expecting for $10 that I would get a small to medium-sized salad, decent for a light lunch or snack. I was completely shocked when a WHOLE salad showed up. Not only was the portion size generous, but it was liberally covered in blue cheese, pistachios and pear. It was truly amazing. I’ve gotten so used to the “standard” miniscule portions that pass for salad most places, that I was literally so impressed with that alone I had to mention it. That wasn’t the only reason I felt inspired to write about this salad. Additionally the pistachios were fresh, hadn’t been dried out and over salted like in most places. There was a ton of blue cheese, so I had enough for every mouthful and the pear was in little shredded bits to I could have a bit of everything in every bite. AMAZING. It really is the small things in life, and this salad made my day yesterday. In my haste to devour this delicious salad I didn’t do it justice with the picture, but they have lovely pictures on their website. I will be going back, and I’m sure I’ll be taking a better camera next time. Good, actually I hope better than good, but for argument sake, I’ll stick with good. Cheap, let’s say approx. $20 for dinner, $10 for lunch a little more is fine. Please, no chain restaurants or franchises. I’ll be taking suggestions through the month of February and will begin posting my experiences in March. I can be a bit fickle, and I go in and out of phases but this is my top 10 restaurant list at this moment. I expect to update this list periodically. There are a number of reasons for my choices above, it’s usually a combination of quality of food, price, although some are much more expensive than others, and overall experience when I’ve dined there. 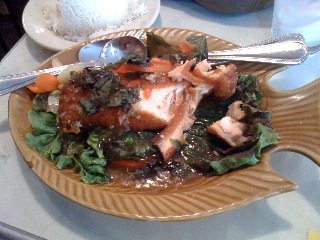 They are in no particular order, although I would have to say that True Thai does usually top my list. I realized I’ve missed a few, these all deserve honorable mentions but didn’t make it on the current list of 10. 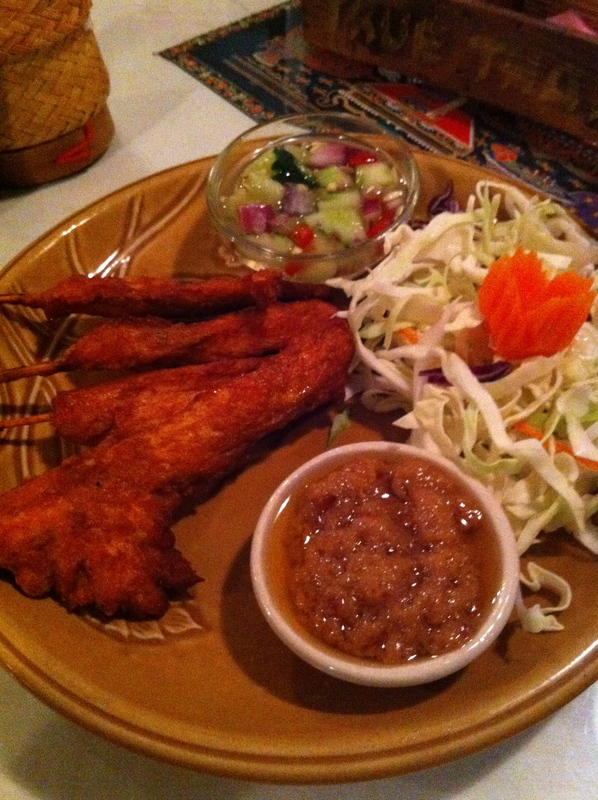 Adelita’s – recommended by a friend, simple but tasty and not spendy, which is always a plus. Buon Giorno, the deli, not I Nonni, sorry Frank! Sakura – service can be spotty, sorry Miyoko! The first most obvious answer to this statement is of course that I love Thai food as I’ve previously mentioned. (However, since I’ve never been to Thailand I don’t pretend to be an expert on authenticity.) There is however, a second more subtle reason that I choose True Thai as one of my top 10 restaurants of all time. Good ol’ business savvy and emphasis on quality. Through going there frequently I’ve gotten to know one of the owners Anna, pretty well and she not only remembers us, but remembers details of our preferences, spoils us with treats when we go there and routinely ask us to try new things she’s adding to the menu. All these small gestures demonstrate that she appreciates our business and hopes we continue to come. She pays attention to details, which is evidenced by the fresh flowers on the table every day and the fanciful way all the dishes are garnished, not to mention the beautiful dishes themselves. She is usually the first face you see when you enter for dinner, welcoming everyone who walks in and thanking everyone who leaves. She remembers names and/or specific details about her regulars orders and often offers recommendations based on what you’ve ordered in the past. In addition to knowing her customers, she has a very high standard of freshness and quality that I’ve rarely seen in restaurants sustained over a long time. In the summer she grows many of her own peppers and basil in the back of the restaurant and has a local grower who grows the rest of her produce, which only adds to the flavor and quality. Anna has her own blog which I read pretty regularly. She does a great job of educating people about Thailand with a witty mix of personal life and the restaurant business. I admire her business savvy and appreciate that her customers are an extension of her family. If you haven’t been to True Thai, I would highly recommend it. PS: Call for a reservation on weekends or other busy times or it might be a little bit of a wait to get seated.